First of all it can be very hard to find the most professional, reliable and easy to use hair straighteners on the market and because of that we think it never hurts looking in as many places as possible to find the best. Therefore with that in mind, we have created a review for The Wazor professional . As a result, this review is to see if they really are one of the best hair straighteners for afro hair! Summary: These Professional hair straighteners are great for more difficult hair types such as Afro Caribbean hair. Also whilst still considering the health of your hair. What is the best material ? Furthermore when it comes to the material, this product straight away puts itself into the high end category of straighteners. 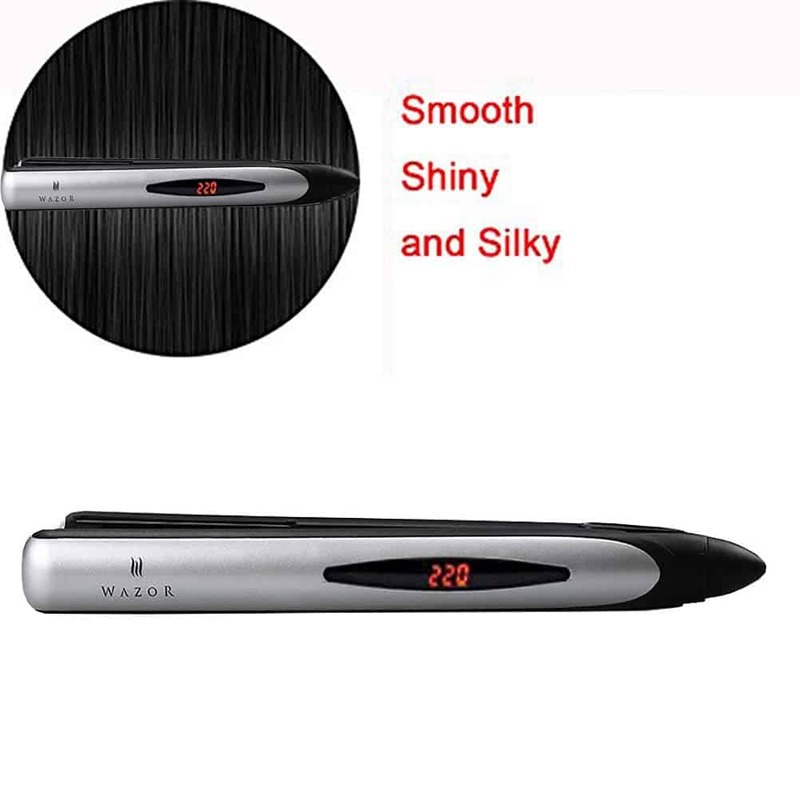 Therefore the ﻿﻿ceramic hair straightener is a very good choice and this product does manage to offer you a great quality and durability all for one low price. It also allows you to take the experience to new heights with an amazing focus on results and a great user experience all around. In addition we would really recommend this particular straightening material for the more difficult hair types. 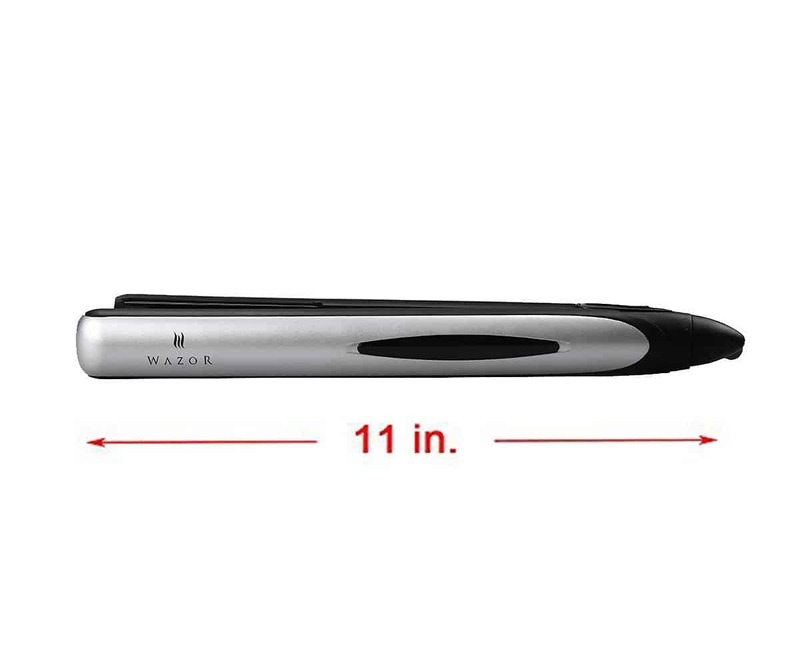 Therefore the Wazor ceramic straightener is definitely a great iron for thick, curly, long and African-american hair. Also as these straighteners have large and wide plates which gives quick coverage with a high heat, but it also has a narrow construction so that is can be used for bangs. What features do these straighteners hold? Firstly, the ceramic floating plates that you can find here are designed with ease of use in mind. In addition enabling you to be able to straighten a larger amount of sectioned hair of more difficult, coarse hair in one easy, smooth glide. They have particularly thick plates which means that the overall coverage will be a lot faster. In addition, having ceramic plates also means that it will give an all over heat throughout the whole plate which then leaves no hot spots through the process of straightening your hair. Also there should be no damage to your hair follicles. Furthermore, the professional straightening iron that you can find here, has a 30 second heat up time.That’s fast compared to other models on the market and you do get access to some incredible results once you start using it. They are easy to store, very light and user-friendly, they work like a charm leaving your hair healthy, smooth and silky. Also we enjoyed the fact that they added an automatic shut off feature because there are situations in which you can accidentally end up leaving it on. which as we all know is a situation we want to avoid the best way you can. Thankfully, you won’t have to worry when using these straighteners. Safety is a very important feature we like to see. What is the temperature ? Therefore, the overall temperature of around 430 degrees is definitely high compared to others but with this being one of the best quality straighteners on the market. We have found it has a lot of quality features integrated into the straighteners in regards to safety. With this high heat available it is able to tackle the more difficult hair types. Furthermore, with the two-toned design in silver and black, the digital display is clear and easy to ready, with this beautiful, sleek design. Also the design means you are also protected from burns unlike some straighteners in comparison and it’s easy to maneuver in one hand. Finally, the product does a great job when it comes to offering you some extra stuff. Such as digital temperature control as well as a complete attention to detail. In addition the quality of the product. It also even has a M button that memorizes your favorite temperature preferences for consistent results. In conclusion this just makes the experience more refined as a whole. Firstly a great product and I get comments on my hair when ever I use it. It is the most efficient straightener I have ever had and really easy to use. Therefore I would definitely recommend these straighteners. Finally you don’t have to acquire a great budget for this product, because as you always know the best value comes with a small or at least an affordable price under £50.00. 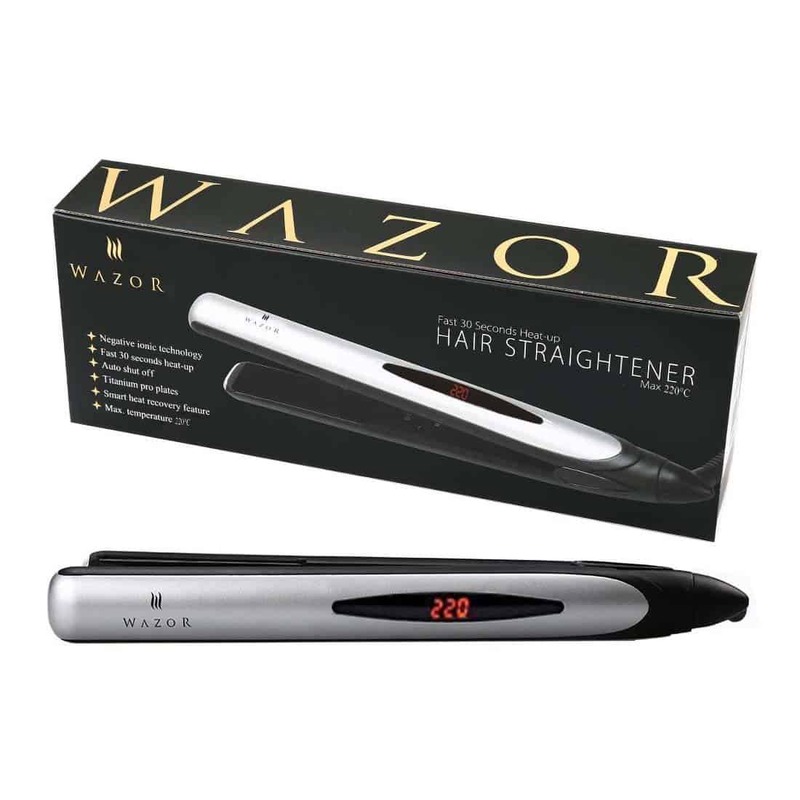 The Wazor straightener is indeed a unique, top selling product with a huge range of amazing and easy to use features. In addition we also like the fact that they do a very good job with the overall performance of this professional straightening iron. Not only is the hair left shiny, smooth and healthy, but it also goes out damage-free, which is hardly the case for many other straighteners. 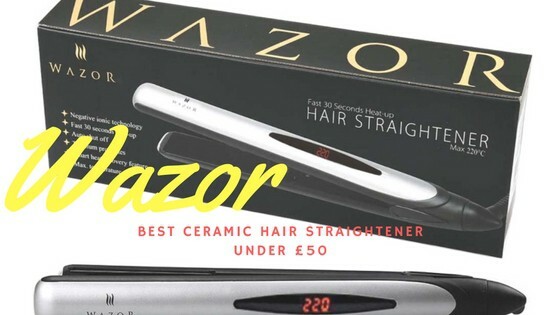 In conclusion, the Wazor model is indeed one of the best value straighteners on the market. It also offers a great hair protection, ease of use and durability. Furthermore, while it doesn’t have a multitude of colors to choose from, it’s still well worth your time.